The bar and clubroom of the Hammersmith, West London based Kensington Rowing Club in the late 1950s. The subject of this article, Henri Benardout, is at the back, wearing glasses. Also mentioned is Jimmy Pigden, nearest to the camera on the right, and John Dixon, sitting between Jimmy and Henri. ‘A book of memoirs based upon a little Jewish boy’s war and post-war years in London of the 1940s and 50s, brunged up at an exclusive Public School, working as a solicitor all his life but living the last half-century in ever-exciting but oh so unpopular Israel, is not exactly the stuff hordes will rush to read. Not a few publishers have very kindly confirmed this. Even worse, this is not the story of a unique type in his own generation but one out of thousands who could have but have apparently not written about themselves….. But, to plagiarise Chaim Raphael – We are all a Special Case’. ‘I’d had a good life throughout my time [at Tonbridge], was more or less popular, enjoyed my sports, kept up in class and achieved pretty good marks when I put my mind to it….. In my third year I had been introduced to thoughts of Oxford University and the law…..To go up to Oxford one needed good ‘Advanced’ levels of matriculation, which probably meant staying on [at school] for the full five years…..But….. the income tax authorities were coming at that very moment to the unhappy conclusion that Father was not as open with his accounting as he was with his purse……. My schooldays were doomed to be cut very short indeed’. All thoughts of Oxford were put aside when Henri was forced to leave school in 1954 due to his family’s financial problems. Despite this, he was still determined to enter the law. Fortunately, up until the 1980s, a university degree was not required to become a solicitor. The non-graduate could do a five year apprenticeship (‘Articles’) with a law firm, eventually leading to Law Society examinations. ‘Without Oxford, I had to learn my law the Dickensian way – five long years under Articles, the first two without any pay at all and thereafter at a wage scale that was well below the weekly labouring wage for the day’. However, during this difficult period, Henri did somehow make time for sport. This turned out to be a wise move and, in the title of Chapter Seven of The Donkey Within Us, Henri says that during these years and beyond, ‘Rowing saved my Soul’. 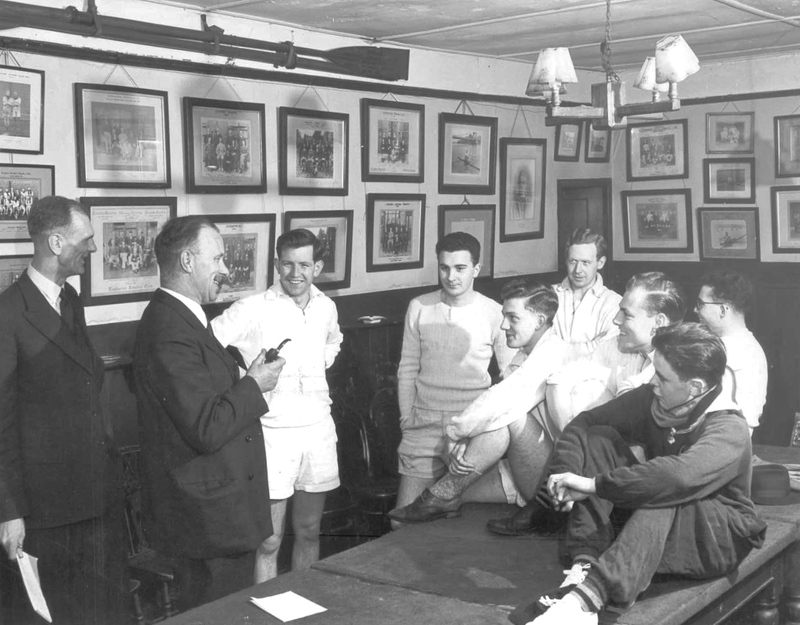 Amongst other things, the chapter paints a splendid picture of a small rowing club in the England of the 1950s, a time when the best counter to lingering post-war austerity was simple enthusiasm – possibly the only thing that existed in any quantity, despite Prime Minister Macmillan’s 1957 speech telling the British people that most have ‘never had it so good’. Inevitably, the club was a reflection of the time, the attitudes and the society in which it existed and which, to today’s young at least, is as much a part of ancient history as are the Tudors and Stuarts. With Henri’s permission, there follows my edited version of his chapter on rowing. The order of the paragraphs has been changed somewhat to make the piece easier to read in a different context to the one for which it was written. I have also added the italicised subtitles. However, I trust that I have kept the spirit of the original. 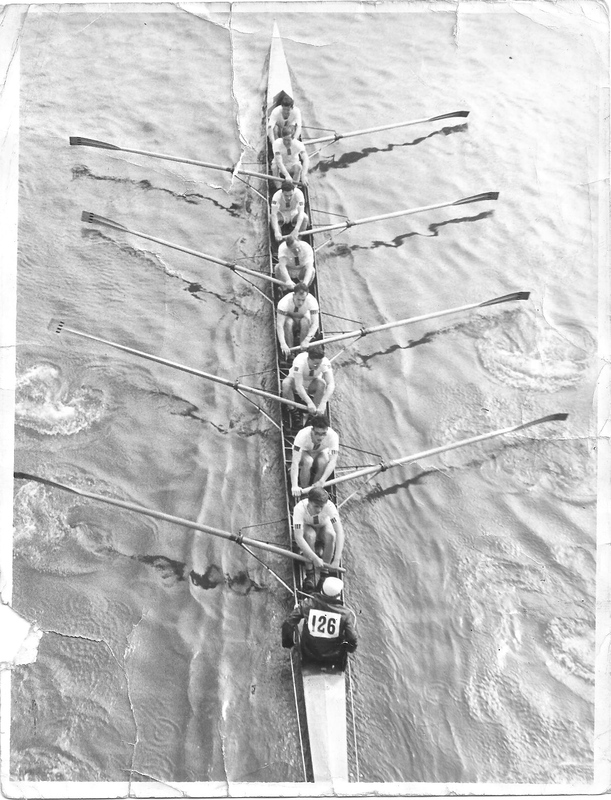 Henri is at ‘7’ in this Kensington Rowing Club Eight competing in the 1958 Head of the River Race. John Dixon is at ‘5’ and Jimmy Pigden is coxing. 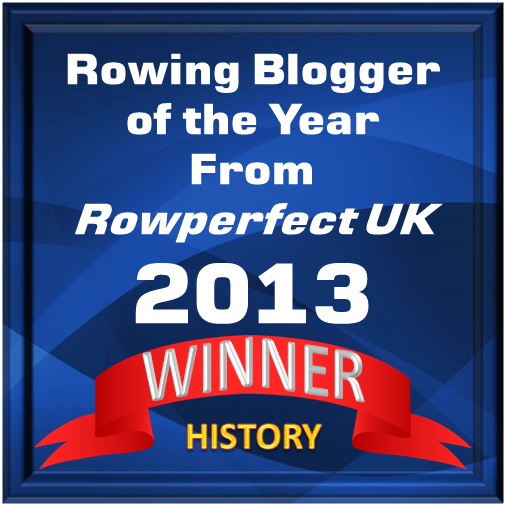 ….. from leaving school and on up to emigration in 1964, over ten full years, it was only rowing that kept me going. It allowed for regular explosions of physical energy, a terrific booze-up once a week and provided the peace of mind that can only come from riding the tide in a well-balanced eight. I chose to row (at school), being unable to see a small ball in motion and thus having no ability for cricket, tennis, squash and all that…… But to hit the water with an oar seemed to require a less complicated coordination than to strike a ball moving at 70 mph or more…… My rowing was rough and ready but enough to earn a place in the school’s Fourth IV thanks to muscular power. The only thing to be said in the crew’s favour is that the number 3 in front of me, Richard Norton, later won the Silver Goblets at Henley….. He was one of the most pleasant and elegant persons I’d ever known. I was a wild but successful boxer at school – until I was required to fight Richard. It was suddenly impossible to treat him as I had treated everyone else (but) since he was even less skillful than I, my punches went through but none of his did…. I eventually begged him to drop to the canvas because he was taking an awful beating…. Naturally, he rejected this ungentlemanly offer. Victory may have been on points but I never boxed again with any serious effort. The anger that had made me a successful boxer had gone. I very much regret that I never thanked Richard for how he had innocently helped me. When I’d left school and started to work at John Barker’s (department store), we still lived on Kensington High Street, with Hammersmith just down the road. There were a few oarsmen from my old school at the vastly more important Thames and London rowing clubs, but I wanted something a little less demanding, for summer week-ends, so joined the Kensington Rowing Club under Hammersmith Bridge based solely on the logic of its name. One of my few very successful choices. To begin with I rowed only in the summer season since I played London Club Rugby in the winter, but after three years or so rowing took over entirely. Kensington, founded in 1872, had produced Olympic and top-flight scullers in the more distant past, out of whom W.D. ‘Wally’ Kinnear was still alive and well and whose company we had the honour to enjoy and to receive from him encouragement over his last years…… You felt that you were in the presence of Gods looking down upon you from the sepia photos of a society long gone. It was perhaps a club best suited to the individualist, but no matter. We enjoyed all our rowing, all the time. This was the middle 1950s and small clubs like KRC were still trying to revive membership after the war, so anybody was welcome. For ten years I was a very active member, taking on positions from Asst. Secretary….. to Secretary and then to Vice Captain, appearing momentarily at Henley for a few years running and rowing Heads of the River and all the regattas from Reading to Putney and back again. Even won a few trophies now I come to think about it – the’ve been upstairs in the attic for decades, banished by my late Wife but are now allowed back into the light. Sorry dear……..
We were a weird and wonderful bunch, always a source of mystery that nine such conflicting shapes and personalities from such diverse backgrounds, eight of us alas, with conflicting rowing styles, could be brought to do the same thing for hours, keep the rhythm, follow the leader, apply or reduce pressure when the Cox so ordered, but rowing is the epitome of team work. I look over the few photographs I have been able to collect up over recent years and remember all with the greatest affection…. (There) was Buster Marnoch, a healthy built South-African, after whose sister I unsuccessfully lusted for years, who was part of the boat’s power house….. we used to get very silly on Drambuie and talk to the stars till dawn… Our coxswain, Jimmy Pigden…..(today) still rowing, coxing and sculling with the veterans….. We had a Cambridge man… whose college style was totally different from ours…… (Bow) could not resist trying to stroke the boat in a middle of a race… (Stroke) could not be hurried even when it was absolutely essential. We regularly had Norwegians, Danes and Swedes in the boat…… each with his own home-grown rowing style, and yet the crews were crews and actually won races. Except that, at Henley Royal Regatta, we rarely got past the first round. Practicing for Henley, 1958. Henri is at ‘2’. I never sculled but rowed all the other boats, perhaps most successfully in coxless pairs which were more of a challenge, something of a dare, since we always seemed to go out on what promptly became nasty, choppy water, and I was steering, with my eyesight and glasses covered with spray. Indeed, several times we were forbidden to go out at all, but ignored the prohibition. This was because John Dixon, whose partner I was….. was an even bigger thug so that we could always manage somehow…. The boat was very old, from well before the Second World War, unusually long and would twist in all directions at once, but remained solid and sang like a bird once you got it moving….. When in 1964 I told (John Dixon and his wife) that I was leaving for Israel, they didn’t understand what I meant – Why? I explained that I was Jewish. They said: Oh, are you? And that Israel was the Homeland. Ah! Embarrassment rightly overcame me – I had never realised that there really were people who couldn’t care a damn what you were, so long as you were a friend. A lesson in humility. The Club nurtured an appalling culture of bequeathing girlfriends after expiry date, what do the young ladies today know of chauvinism? But the ladies were themselves besotted by rowing men and were perhaps as weird as we were. No one ever tried to work that out of course. All happily accepted the system. Anne….. was one of those noble gals and we were together for many years….. Marriage was always off the agenda although I discovered only when parting from her that she had secretly remained hopeful. But her Wesleyan mother didn’t care for a Jew in the family and I didn’t care too much for a wife in mine. A neat and convenient balance of interests, which totally ignored hers. The Club’s finest asset was, of course, the bar. 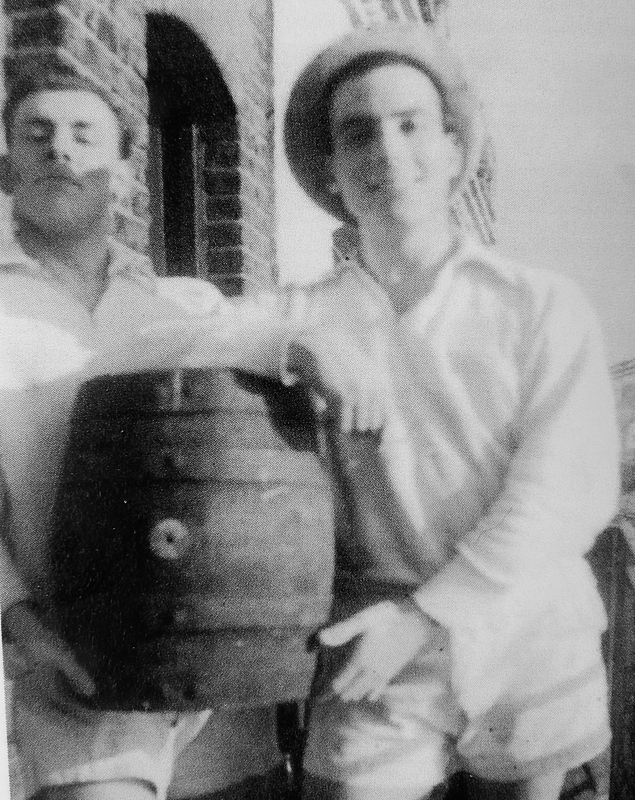 Fuller’s London Pride from the cask was our savior – the wooden cask. Those who may have known it as it then was (it would surely never have met with today’s ecological or health standards), will remember it as a rich, dark bitter which provided a full meal from the hops, husks and rats tails still floating around in it. Didn’t worry us of course; saved money on a meat pie. Prices were minimal, no restriction as long as you could still get down the spiral iron staircase to the Lower Mall and set off home on two feet. None of us had cars anyway, only a couple of the richer girlfriends did. When already well gone, the evening’s challenge was to raise a full cask above the head in one sweet motion… John Dixon and yours truly regularly managed that. Another free round lads. On the KRC balcony, left to right: John Dixon, a wooden cask of Fuller’s London Pride, Henri. At a visit to the Club in 2009 I discovered that there is no longer anything resembling the beer drinking culture as obtained in my time, when the rowing provided both the excuse for it and the antidote. Maybe policemen’s headgear is still lifted, the municipality relieved of its road signs and the pubs up and down the Thames of their garden accessories – petty theft on a grand scale – but today there are CCTV cameras everywhere …… the road signs are totally without any artistic merit; the copper’s flat-cap a quite worthless trophy. We did have one special talent, though I fear that it too is a thing of the past – not being politically correct. There was not one amongst us who could not sing the unexpurgated version of The Lincolnshire Poacher or The Harlot of Jerusalem and a dozen other classics through to the end without a hitch – it was a matter of Club pride. It was a matter of pride too to sink eight full pints of bitter after Saturday’s regatta when you had more than once blown every gasket in the final 200 yards and needed to restore the body salt in preparation for the next morning’s light paddle. And most of all it was a matter of pride to turn up on time for the Sunday morning outing to restore the breathing and reorganise the muscles, get back into action, just a gentle ten-mile paddle……. Stupid pride, but quite wonderful!! …….. As a sport (rowing) has always been for madmen only, and in those days, not only the training and the discipline but the drinking were always taken to the extreme. The amalgamation had prompted and allowed for the total gutting and rebuilding of the Club’s premises; they even have a function hall for renting out for profit. And at last – provide showers and toilets that are not disgusting and training facilities that are not laughable… even for the newly allowed-in lady members too. But all this seems to have put a stop to the heavy drinking, cussing, and singing of bawdy songs…… A pity really, but…. progress will always demand its price. The dedication Henri wrote in the copy of his book that he gave to Auriol Kensington Rowing Club. Rowing brought one to regularly throw up the immortal soul, as Mark Twain put it in another context, to go beyond all feeling, to overcome pain with the passion to win – and to recover fast….. [The reader is] lucky that I do not have the poetry to expand on what rowing did for the soul, except to say simply that it massaged and saved mine. Henri Benardout (a.k.a. 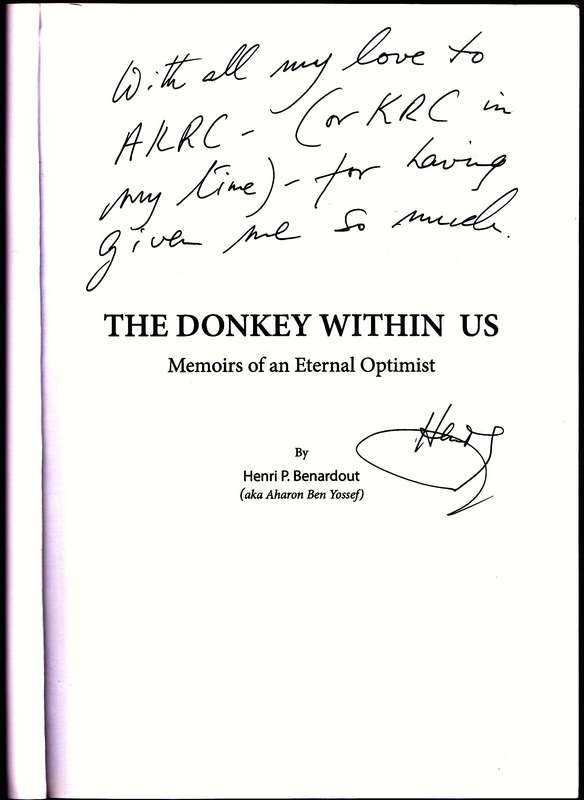 Aharon Ben Yossef) has made the entire original version of his The Donkey Within Us: Memoirs of an Eternal Optimist (2012) available online as a free PDF. Download it here. Further, Henri will send a copy of the book itself by mail, also free of charge. Contact him through his website. It is amusing and often thought provoking read, however much you agree or disagree with Henri’s philosophy of life – a life that has included a lot more than just rowing. Another lovely piece of nostalgia . Although I joined my rowing club, Quintin Boat Club, just as Henri was setting sail for the promised land a lot of his recollections ring true, especially the cameraderie and the beer but not the singing. We left that to the ruggermuggers.